Desmoplastic ameloblastoma (DA) is one of the rare pathological variants of ameloblastoma. 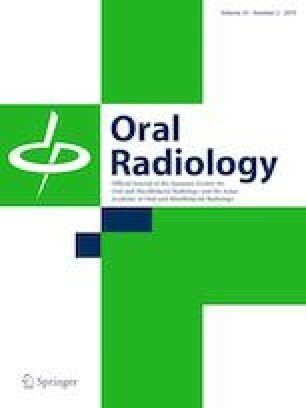 The purpose of this study is to investigate CT and MR imaging findings of DA. We retrospectively evaluated six DA cases that were gathered from four different hospitals and confirmed histopathologically with resected specimens. Two radiologists who specialized in head and neck imaging retrospectively interpreted and reviewed pretreatment CT and MR imaging findings. On CT, all DAs presented with well-defined border and low internal attenuation. Regarding locularity, five cases showed honeycomb-like lesions and one showed a unilocular lesion. Bone expansions were seen in all patients and located on the labial side in four cases. On MR imaging, all DAs showed well-defined borders and solid moderately low signal intensities with small cystic high signal intensities on T2-weighted images and intermediate signal intensity on T1-weighted images. Five DAs showed linear low signal intensity on T1- and T2-weighted images. Gd-DTPA-enhanced MR imaging was performed in three cases, and all cases showed moderate enhancement. Dynamic-enhanced MR imaging was performed in two of them, and persistent enhancement was detected. Our findings strongly suggest that MR imaging should also be consulted, particularly for honeycomb-like lesions with well-defined margins, bone expansion and anterior location on radiographs or CT. Additionally, findings by MR imaging such as solid low-signal-intensity, hyperintense cystic foci and persistent enhancement pattern will suggest the diagnosis of DA.